In honor of Black History Month, Kennedy Library is showcasing an exhibit titled Where We Stand in collaboration with University Archives and the History Department Internship program. This exhibition is free and open to the public. Hours: The exhibit can be seen during Regular library hours. 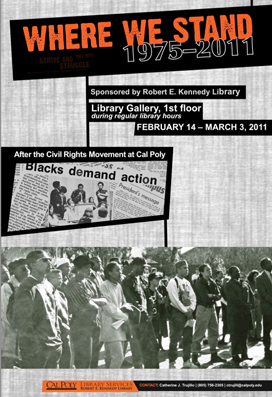 Where We Stand is an extension of the 2009 exhibit Strive & Struggle: Documenting the Civil Rights Movement at Cal Poly, 1967 – 1975 and similarly draws from Mustang Daily articles, student club documents, and oral accounts to construct a brief history of African American advocacy on the Cal Poly campus from the Civil Rights Movement to the present day. The exhibit documents the roles that student and faculty organizations played in building awareness of issues of diversity and identity on campus. Assessing their efforts reveals both what has changed since 1975 and what remains to be addressed on the Cal Poly campus. The Black Student Union, fraternities and sororities, faculty groups, the Society of Black Engineers & Scientists, and the Multicultural Center served as catalysts for student empowerment. 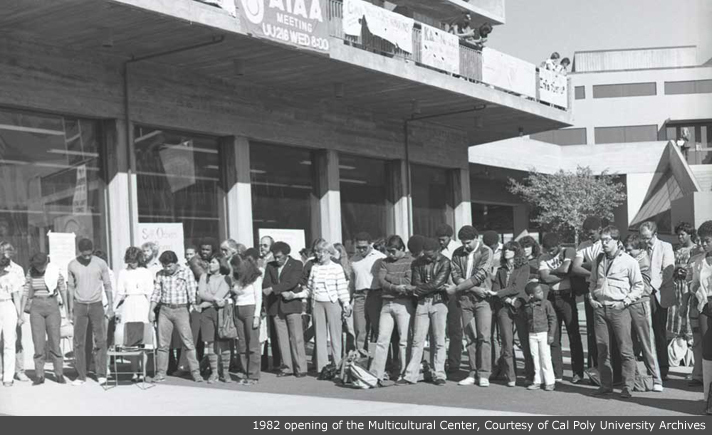 These organizations promoted African American culture and diversity on campus at a grassroots level and established a community for black students at Cal Poly. Despite difficulties in obtaining both members and recognition from the student population, these organizations remain relevant and are crucial to campus efforts to reach a shared understanding of issues of race and diversity. Already Sunday! It's 9:05pm right now.